How to make additions and corrections. After consultation and consideration, is clear that I cannot simply allow an individual, registered or not, to make changes directly to the on-line database. Aside from issues of data corruption, deliberate or otherwise, I fear that information would be lost or scrambled by the process of swapping the huge file back and forth between my computer and the on-line server. I could not reliably capture any changes and they might get lost. The option to allow registered users to edit selected parts of the trees does not seem feasible with my software and still would require swapping files. There is another way built into the software that I want to use. On all of the individual and family pages there is a “Suggest” tab. When opened, it permits you to suggest any additions or corrections. 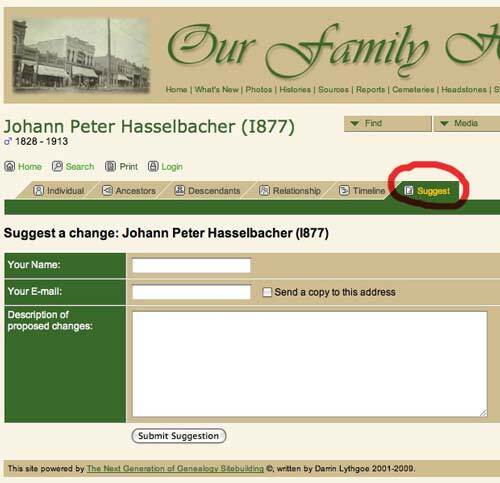 You can type the information directly or paste in from elsewhere. When you submit the information, it is sent to me directly with an identifying number so I can easily tell whom the information refers to. I simply make the additions to the master file and upload it at the next update. I am able to accept simple items such as names dates and places, or free text that can be added to the “notes” section of the relevant page. These types of stories are wonderful gifts for our descendants. When the information is sent to me directly, no one else can see it. When I upload the master file, I use privacy screens for the living such that no information other than the person’s name is put on the Internet in any form. If you have a lot of information, and particularly if it is organized in a digital way such as the GEDCOM output of your genealogy program, I can append it directly to the master file through an existing person. That is the easiest way for me. However, if you have an extensive tree that is only on paper, I am willing to deal with that too. Email me directly and we can make the arrangements. The TNG (The Next Generation) software that powers the interactive family tree has the ability to store images and other media in several categories. There are buttons on the home page to access such stored materials. I have not used these capabilities, preferring to place images and other special items elsewhere on the website. I encourage you to submit such items to me directly. I suppose if I get lucky and many such are submitted, I will learn to place them within the database directly. Peter Hasselbacher, 7 Apr 2009.